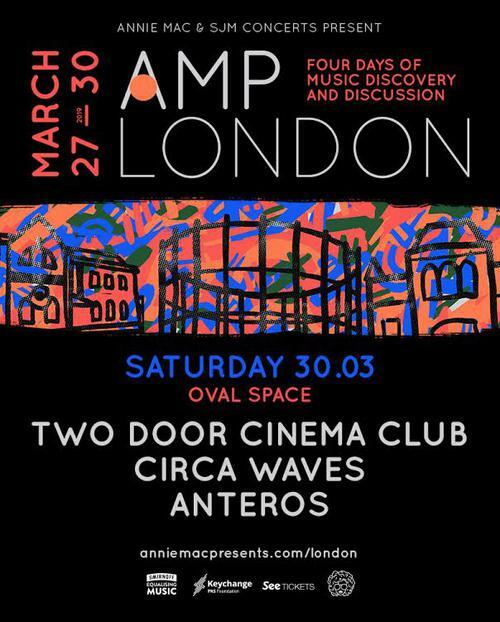 Two Door Cinema Club will headline Oval Space on 30th March for Annie Mac’s inaugural AMP London series. The show will bring to a close the series of live music, talks and discussions taking place in London between March 27th-30th. This announcement follows the release of ‘Talk’, Two Door Cinema Club’s first new music since their 2016 Top 10 album ‘Gameshow’. ‘Talk’ was unveiled as Annie Mac’s Hottest Record In The World on Radio 1 on Monday. Watch the video here. “We’re over the moon to have Two Door Cinema Club perform as part of our first ever AMP London series of shows. It will be so exciting to see them play in a space like Oval Space,” says Annie. The show is the band’s first London performance since they headlined Community Festival last summer in front of a crowd of 35,000, which makes the prospect of seeing them in the intimate setting of Oval Space particularly exclusive. Support comes from two of indie pop’s brightest lights in Circa Waves and Anteros, both of whom have hotly anticipated albums on the way this year. Tickets go on sale at 9am this Friday.